When I came home from work this evening Jen was in good spirits but looked like she was starved for some level of excitement. She has been taking this whole bed rest thing extremely well, far better than I would have thought or than she promised to. Her simple request was that we take a drive around. That way she could see things and still follow the guidelines of her bed rest. So we got in the car and drove around the various mansions that surround our old, raggedy, two bedroom apartment. We took a long, meandering trip to Home Depot to finally refill the propane tanks and meet with an audacious cashier lady who asked Jen how pregnant she was then declared, "Oooooh lord, the final barbecue!" 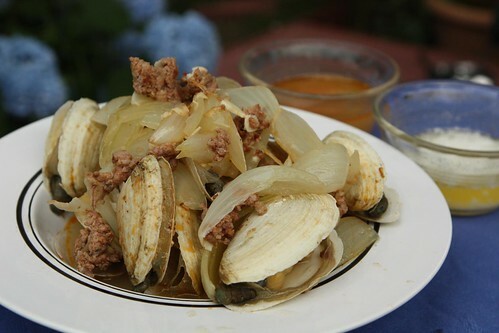 I continued with a vague Portugueses theme by making these steamers with chorizo. I browned up some garlic and chorizo in olive oil, tossed in some vidalia onion, then threw in the steamers with a little water and steamed for five minutes. It's a version of the "recipe" we used at the first restaurant I worked at except that one was notably simpler requiring only onion and water. I melted some butter on the grill and served with a little leftover broth for dipping. 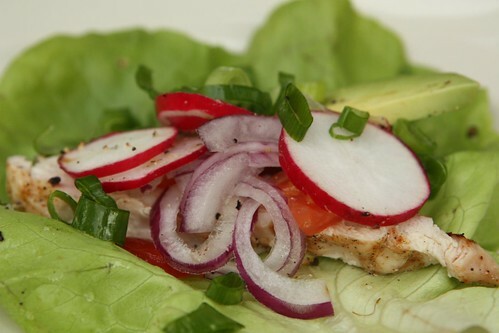 After We were finished enjoying the steamers I grilled up a chicken breast and served it along with whole leaves of green leaf lettuce from the farm, avocado, red onion, tomato, scallions, and sliced radish. It was like tricking Jen into eating a salad by telling her that this was actually lettuce wraps. 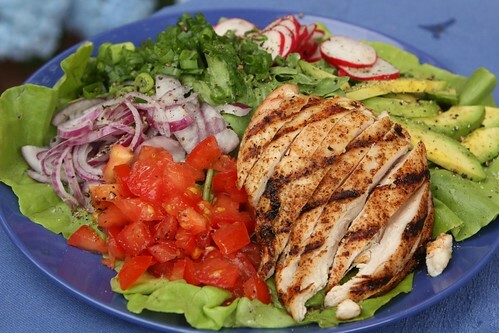 They were actually quite good and this was one of the simpler and healthier meals we've had in a good long while. Probably not what the lady at the Home Depot had in mind for a final barbecue. 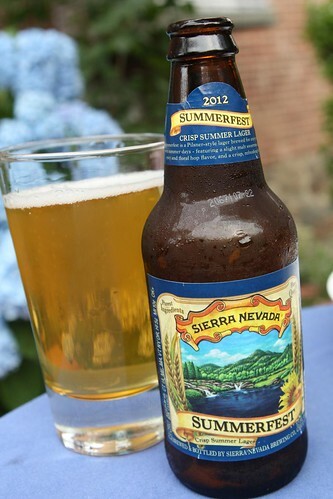 For a beer I had this Summerfest Crisp Summer Lager from Sierra Nevada Brewing Co. This was a bit more promising than last night's beer. I hadn't actually read the label before pouring it and I was a little disappointed when I saw that it was a lager. Crisp Pilsner-style lagers have their place, don't get me wrong. When I'm in the mood for a lager I really enjoy them but I had been thinking this would be a flavorful, hoppy ale like Sierra Nevada normally brews so I was a little thrown back. Nevertheless it was a good beer but probably would have been even better had temperatures been about ten degrees warmer. I hope the lady at Home Depot was wrong. I hope this is not the last barbecue. It's going to be quite cool next week so if the babies decide to come on the scene a little early she could be right. I just hope we have a few more opportunities to enjoy some outdoor summer cooking as it's only the fourth day of summer. Perhaps I can convince my mother and sister-in-law to change up poopy diapers while I am still able to grill up a storm outside. I love to prove Home Depot ladies wrong.